Total: 41 Min. | Active: 35 Min. The original recipe with guaranteed success is for 12 pieces. Altering the number of portions may result in alternate results. Please note that the existing quantities are not automatically adjusted in the text. Using the whisk on a hand mixer, beat the sugar, egg yolks and water for approx. 5 mins. until light and fluffy. Beat the egg whites with the salt until stiff. Add the sugar and continue beating until the egg whites turn glossy. Combine the flour and chocolate powder, sieve into the mixture in layers along with the egg whites, carefully fold in using a rubber spatula. Spread the sponge mixture into a rectangle (approx. 1 cm thick) on a baking tray lined with baking paper. Approx. 6 mins. in the centre of an oven preheated to 220°C. Remove the sponge, tip the cake and paper out onto a fresh sheet of baking paper, wipe the upper layer of paper with a damp towel and peel away carefully. Cover the sponge immediately with the upturned tray, leave to cool. Beat the cream and syrup until stiff, set aside one third. Mix the strawberries in with the remaining cream. Spread the strawberry cream on top of the sponge, leaving a border of approx. 2 cm all the way around, roll up from the narrow end. 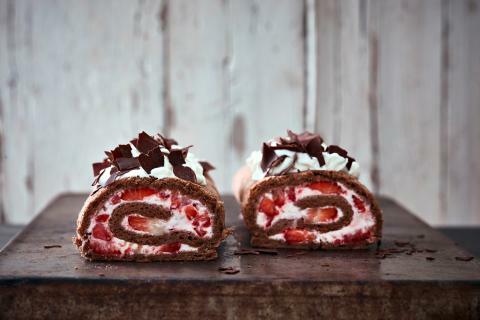 Spread the reserved cream on top of the roulade, sprinkle with chocolate shavings.